With all the interest in the new Ely Sasquatch Video, it seems like a good moment to mention the time-space links to Red Lake, Minnesota. Both locations are in northern Minnesota, just south of the Canadian border. Ely is 200 miles due east of Red Lake. Yesterday, as the Ely Sasquatch Video was exploding onto the internet via such sites as Cryptomundo, Boing Boing, The Anomalist, and Coast to Coast AM, the day also marked the first anniversary of an infamous school shooting with strange ties to Bigfoot. 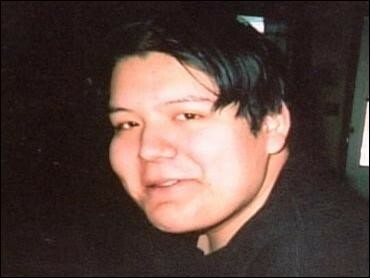 On March 21, 2005, Red Lake, Minnesota high school student Jeffrey James Weise (August 8, 1988 – March 21, 2005) killed a total of ten people. First he killed his grandfather and grandfather's wife, 32-year old Michelle Sigana, who was his grandfather's police force partner. Later he shot and killed seven people at Red Lake High School, including a teacher and a security guard. As many as 15 others were wounded in the school shooting. After briefly exchanging fire with police officers following the murders, Weise died by his own hand. The incident began at home in the afternoon when Weise apparently shot his grandfather and Sigana. Weise then drove his grandfather's patrol vehicle to the high school, propelling it into the building at around 3:00 p.m. CST. Wearing a reservation-police-issued bulletproof vest, likely taken from the stolen reservation police patrol vehicle, Weise killed the third victim (the security guard) immediately upon arriving at the school. When the police first arrived, Weise briefly opened fire on them before going into the school. Once in there, he was said to be "waving and smiling" as he shot students at random. An attempt to break into an English classroom was thwarted by a quick-thinking teacher who had taken the precaution to lock the door. Media coverage of Jeff Weise after the shooting was intense. Weise left electronic footprints all across the internet, on websites such as nazi.org, offering, as Wikipedia noted, "an unusual level of public insight into his thoughts and the hardships in his life that led to his depression and fascination with dark imagery in the months and years prior to the shootings." Besides being a neo-Nazi, liking Hitler, seeing white owls, having dreams about shooting, Weise also was interested in Bigfoot. The simple fact is the Red Lake school shooter liked to talk about Bigfoot, and we have the records to explore how Bigfoot worked into his cosmos. Jeff Weise would post as "Weise" at the Above Top Secret forum. Almost everyone I know has a sasqautch story, almost everyone one has a person in their familly who's probably seem him. At least thats how it is where I live, (on a Reservation in Minnesota). I've asked a few elders about bigfoot, and in my language (Ojibwe) we have a name for him. I forgot it, and barely could pronounce it, but he exists in our neck of the woods, at least I believe he does. I heard a story from my cousin (he works in Tribal Government), he told me that a guy he worked with was out in the forest alone on a fast. He was near a swampy area, and midway through his fast he saw Bigfoot walking through the swamp, reaching down into the water along the way and pulling up a certain type of weed and slinging it over his shoulder. The weed from the swamp he was pulling out was supposedly some kind of herbal medicine used by Native medicine men. And to feed some of you peoples interest in the possibility of a sasquatch and alien connection? The lake I live by (Red Lake) is one heck of a big lake, and if you sit out at the beach on a clear summer night you'll see lights over the lake. Everyone says they're UFO's, I believe that too. There was a UFO sighting in broad daylight a few years back, it was over the lake, people said it looked like a metal disc. Anyway, alot of people were reporting power outages and cars stalling on them around the exact same time. Later on 11-11-2004 (November 11, 2004), responding to this quote (filled with incorrect info) from Brainiac: "Hi! The Bigfoot idea was recently found out to be made up, by the same guy that supposedly capture the creature on film in 1974. He said on his death bed that he made the whole thing up. The footage was real, but it was footage of a man in a gorilla costume... "
Lol, sorry, but that just wont fly in my part of the woods. We've actually seen him, in the "flesh," not just a video. The stories of bigfoot, as previously stated, have been around for hundreds of years, not just since the Patterson film. 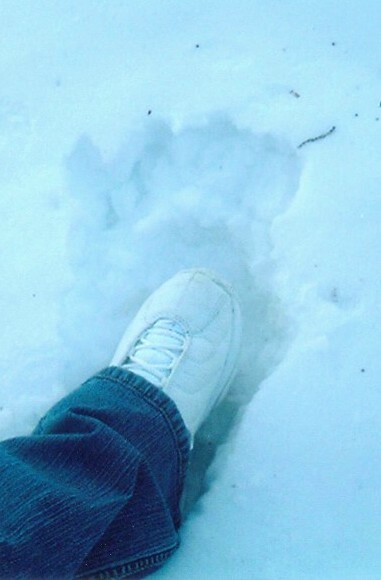 Perhaps not coincidentally, on February 10, 2005, there were reports of tracks of Sasquatch being found on the Red Lake Reservation. Here are examples of two photographs (below) circulated on the web at the time. 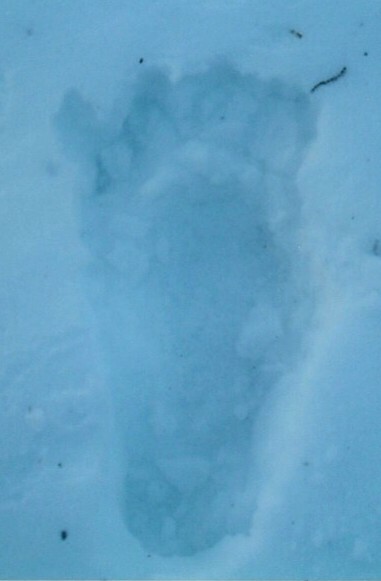 While initially they might look like bear prints, upon closer examination, more clearly defined Bigfoot-type toe prints are visible. On March 21, 2005, the focus was on Red Lake, Minnesota and Jeff Weise's carnage, and the Red Lake Bigfoot track investigations faded into the background. On March 21, 2006, our attention is drawn back to Minnesota, and the new video of the Ely Sasquatch. What does it all mean? It remains to be seen. i think there is a big foot on the redlake indian rez..
Iranian in US Campus "Car Attack"